Last weekend, we went to Indiana to celebrate my grandma's 89th birthday. Since having Olivia, we have turned our visit into a sleepover at Nonnie's and it has become one of my favorite traditions. My grandmother and I have always been very close, and it makes my heart so happy that she and Olivia get to know and love each other. And of course I love the opportunity to celebrate the wonderful woman she is! We had an amazing time, complete with dinner at our regular spot, our favorite donuts for her birthday morning and a special "birthday performance for Nonnie" that Olivia gave. After the birthday celebrations were complete, my mom stayed with my grandma, and the three of us went to the pumpkin patch. We did this same routine last year and were so happy to go back to Harvest Tyme. Olivia was really excited about going this year which made it extra fun. It was suuuper windy (check out our hair in the pics!) but we had a really great time. 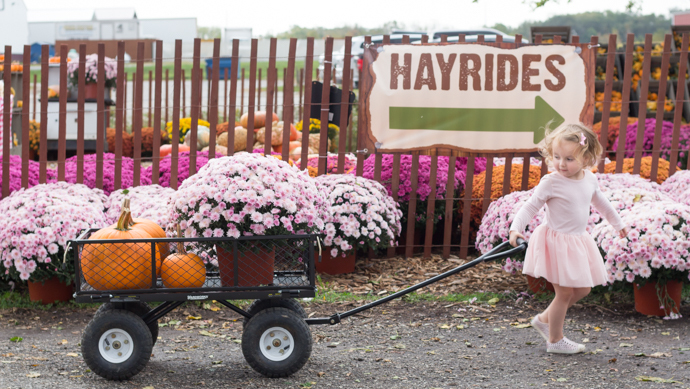 Olivia was so excited to enjoy the hayride and pick out pumpkins with "baby poodle." I swear she kept finding the biggest ones! After we decided on a few pumpkins we were in for a big treat. We happened to be there for their "candy blast." It's exactly what it sounds like: they blast tons and tons of candy into the pumpkin patch and all of the kids run through the patch to find some. Needless to say, it was a major highlight for Ms. Liv. Their mums were the biggest and prettiest I have ever seen and of course we couldn't leave without one of those. Olivia loved pulling the wagon full of goodies and couldn't wait to get home and decorate some pumpkins. It was such a special weekend. I love this fall tradition so much. Stay tuned tomorrow for my favorite, ever pumpkin recipe. We can't stop eating it!